Alex Hay and Robert Rauschenberg in Grass Field, 1966. In 1947, Robert Rauschenberg studied at the Académie Julian, in Paris, before returning to the United States the following year to pursue his studies at Black Mountain College, North Carolina, with painter Joseph Albers (1948-49). There, he also formed friendships with John Cage and David Tudor. He then moved to New York City, where he attended the Art Student League from 1949 to 1951. In the second half of that decade, he created the series of “combines” works, building a bridge between abstract expressionism and the Pop-art movement. 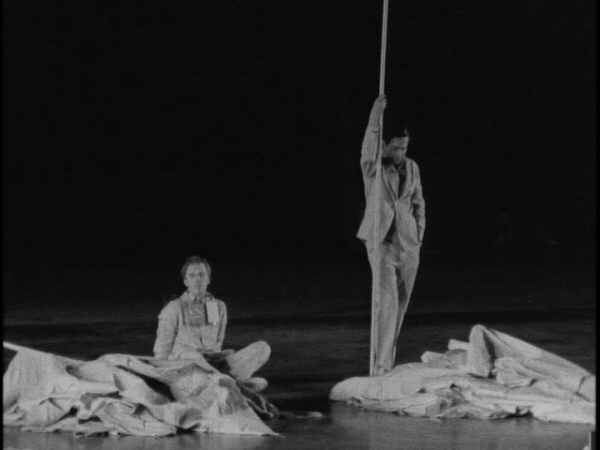 Along with his pictorial work, Rauschenberg designed costumes and sets for many choreographers (including Merce Cunningham). In the 1960’s, his activities became even more diversified, and he joined the Judson Dance Theatre – first as set designer, then as choreographer. During the same period, Rauschenberg experimented with the use of electronics in his art (Oracle, 1962-65, Soundings, Solstice, 1968, Mud Muse, 1968-71). These works incorporated the technical expertise of engineers Per Biorn, Billy Klüver, and Robby Robinson, who were then working at Bell Telephone Laboratories (Murray Hill, N.J., U.S.). In 1966, after his participation in 9 Evenings, he co-founded Experiments in Art and Technology (E.A.T.) with Billy Klüver, Fred Waldhauer, and the artist Robert Whitman. This non-profit organization aimed to promote cooperation between scientists, artists, and engineers on projects involving players from each of those sectors. In the 1970’s, Rauschenberg concentrated primarily on lithography. In the 1980’s and 1990’s, he devoted his attention, through his Foundation, to philanthropic activities, offering financial assistance to artists, protecting the environment, and fighting poverty. Since his first retrospective at the Jewish Museum in 1961, his work has been featured in many individual exhibitions in both the United States and Europe. Robert Rauschenberg died in May 2008 at his home on Captiva Island (Florida). He was 82. Open Score brought together two of Robert Rauschenberg's concerns in the 1960s: technology and performance. In 1965, Billy Klüver sought the expertise of some 30 engineers at Bell Labs, requesting that they participate in an project blending avant-garde theatre, dance and new technologies.